A stay at Filoxenia Hotel places you in the heart of Monemvasia, within a 5-minute drive of Monemvasia Castle and Monenvasia Kastro. This hotel is 25.2 mi (40.6 km) from Simos Beach and 1 mi (1.6 km) from Agia Sofia Church. Located in Monemvasia, Kinsterna Hotel is by the sea, within a 15-minute drive of Monemvasia Castle and Agia Sofia Church. This 5-star hotel is 4.9 mi (7.9 km) from Church of Christ in Chains and 16 mi (25.7 km) from Pila Beach. Make yourself at home in one of the 25 air-conditioned rooms featuring kitchenettes with refrigerators and stovetops. Complimentary wireless Internet access is available to keep you connected. Conveniences include desks, housekeeping is provided daily, and irons/ironing boards can be requested. Basking in its beachfront setting in Monemvassia, this charming hotel offers guests a great location from which to explore the area. Guests will find themselves just a short distance away from a number of attractions. The hotel is located within convenient access of Monemvassia Kastro, Monemvassia Castle, Mitropolis, Kastanic Cave and Plitra Ruins. This marvellous hotel enjoys a delightful exterior, exuding charm and style. The interior is beautifully designed, draping guests in the rich charm and tradition of the area. The guest rooms offer a haven of peace and serenity, featuring earthy tones and muted hues. 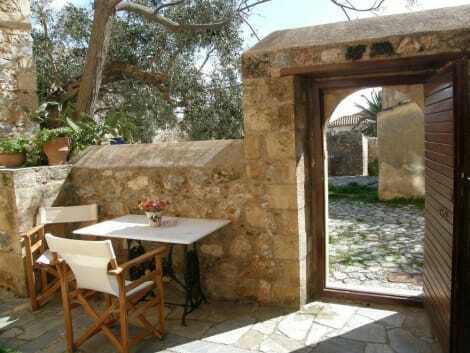 This wonderful hotel offers guests the ideal setting when visiting Monemvassia. Petrino Guesthouse The Petrino Guesthouse (rated 3x000D star) is a mid size hotel in Peloponnese. Both on and off site car parking is available. Guests can enjoy a meal at the hotel restaurant. Room Features Petrino Guesthouse. All rooms have a hairdryer. Wifi internet access is available in all rooms. Leisure Info. The Petrino Guesthouse offers a range of leisure facilities. Other Info. An airport shuttle service is available from the hotel. Pets are most welcome at the hotel. Hotel guests can make use of the concierge service that is provided. Make yourself at home in one of the 2 air-conditioned rooms featuring flat-screen televisions. Rooms have private furnished patios. Complimentary wireless Internet access is available to keep you connected. Private bathrooms with showers feature complimentary toiletries and hair dryers. With a stay at Likinia Hotel in Monemvasia, you'll be just steps from Church of Christ in Chains and Mitropolis. This 4-star hotel is 26.1 mi (42.1 km) from Simos Beach and 0.1 mi (0.1 km) from Monenvasia Kastro. lastminute.com has a fantastic range of hotels in Monemvasia, with everything from cheap hotels to luxurious five star accommodation available. We like to live up to our last minute name so remember you can book any one of our excellent Monemvasia hotels up until midnight and stay the same night.